Taking a vacation with the one you love should be a romantic experience if you have done a little research and planning, but there are certain places that only require you to show up for the romance to begin. Cancún is one of those places! The powdery smooth white sands beckon you to stretch out in your swim suit and bask in the warmth of the tropic sun. Teal waters stretch out as far as you can see inviting lazy afternoons spent floating on gentle waves. Palm trees support swinging hammocks resting in the shade. The exquisite natural beauty is offset with a fun and relaxed vibe that brings Latin rhythms, chilies and margaritas and a warm and vibrant culture. The atmosphere created seems tailor-made for couples! 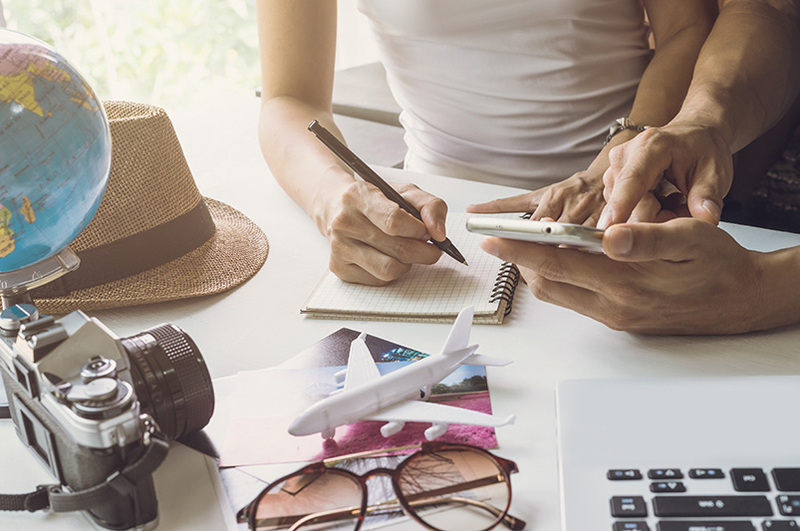 When traveling to Cancún with your partner, you can easily choose to not plan anything at all. Simply laying on one of the world’s most breathtaking beaches can be romantic enough, especially if you’ve chosen a resort like Villa del Palmar Cancun to cater to the details. If you really want to give the one you love an unforgettable vacation, then setting up a few special moments can take your Caribbean stay from lovely to divine! There are a few things that work for all couples, like the perfect romantic dinner spot, the best beach for a day of peace or play and a of course a tropical island. Then it’s a matter of determining what type of couple you are: adventurous, fit, nature lovers, land or sea or both, sun bathers, beach and cocktails, live entertainment, starry nights and quiet moments. Cancún truly has it all! The perfection of Cancún’s beaches is undeniable, but the real magic lies below the surface! Bring wonder and enchantment to your relationship by taking a trip into the waters right off shore or on a boat tour into the deep. 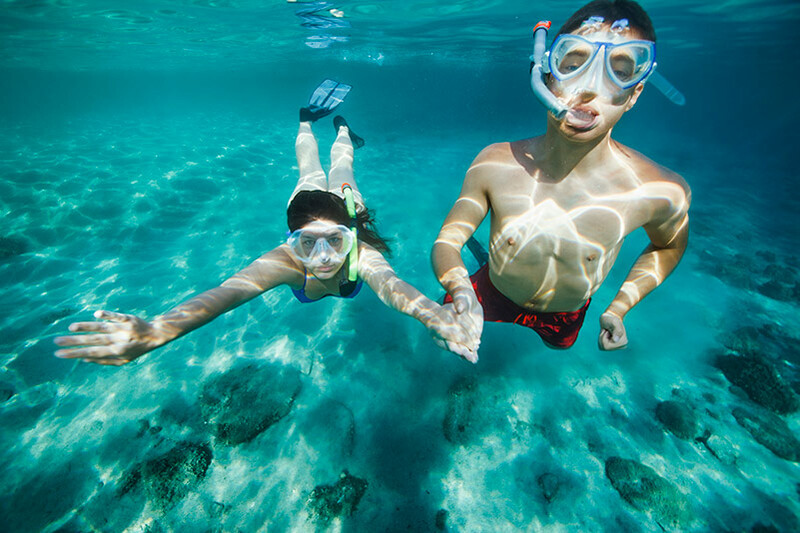 Snorkeling and scuba diving options are abundant in the surrounding sea with natural reefs, fantastic sea creatures and even an underwater museum! Snorkeling is a great way to see below without fully committing to a tank and wetsuit. Head to the southern tip of the island to check out Punta Nizuc. Explore the reef and Nichupté Lagoon as you swim with giant sea turtles, spot gentle manatees and explore the surrounding coral in search of starfish and lobsters. The variety of colors, specimens, algae and anemone will fill your hearts with joy and childlike curiosity at the beauty around you. A truly unique experience is the Underwater Museum of Cancún, MUSA. To give the natural reefs a break from the tourism, statues have been affixed to the sea floor since 2009 creating a visual masterpiece to snorkel or dive. There are two different exhibits around the Manchones Reef system, one which can be seen while you are in Punta Nizuc. Surprise the one you love with a deeper look into the second largest barrier reef in the world, the MesoAmerican Barrier Reef System spanning from Isla Contoy at the tip of the Yucatán Peninsula down past Belize, Guatemala and Honduras. Dive into Manchones, Grampin or the Punta Negra Reef for a spectacular and one of a kind experience. When taking a mini-break in the tropics, it is easy to focus only on the cerulean waters around you, but Cancún offers stunning day trips on land as well. Take a guided hike through the Sian Kaan Biosphere Reserve. This is the largest natural preserve in the Mexican Caribbean stretching out over 1.6 million acres. It is home to numerous species of wildlife as well as dense foliage and long stretches of mangroves down winding rivers. You can hike, kayak, swim, snorkel and even step back in time as you explore ancient archeological sites. For a day neither one of you will ever forget, take a trip out to Xel-Ha! This is considered the most exquisite, natural aquarium in the world! Take a dip into the crystal waters of sinkholes in caves and land known as grottos and cenotes. Wander around Mayan ruins as you learn about centuries old civilization. Take a leap with your love off of the Cliff of Courage into the cold waters below! 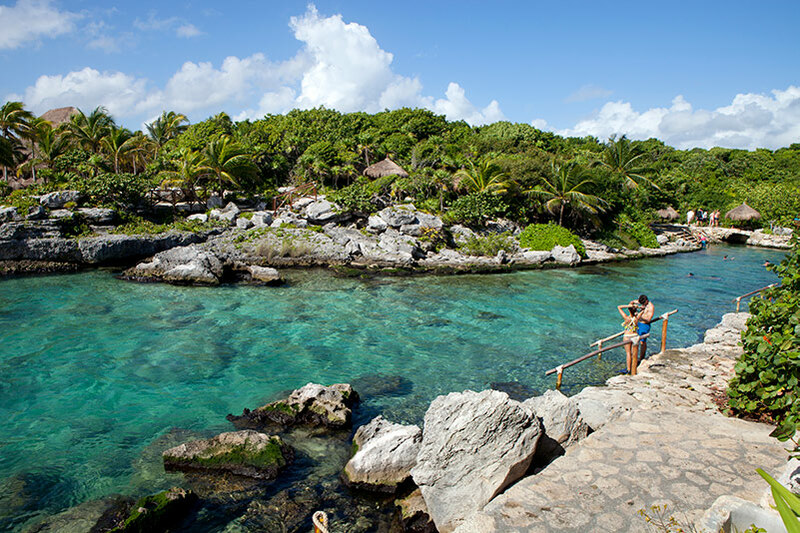 A day will hardly seem enough as the two of you embrace the wild of Xel-Ha. For water and land adventure, explore all the surrounding cenotes through the Yucatan. These natural sinkholes have some of the most beautiful water in the world, at times open to the jungle canopy and others found deep inside cave systems. Take a trip out to Cenote Dos Ojos for open pristine waters or bring set up the ultimate romantic experience with a float down the Rio Secreto, Secret River, into the Crystal Caves. As for the three basics of romance, dinner, beaches and islands, Cancún will not disappoint here either. Though any beach will make for instant chemistry, the right mix of sand, shade and water can make for true love. If enjoying your time on shore is preferable, head to Playa Delfines. The waters are stunning to watch, but you’ll want to spend your time under a palapa covered in tanning oil. For peace and quiet, head to Puerto Morelos or for a day in the sun with fellow beach goers head to Playa Tortugas. 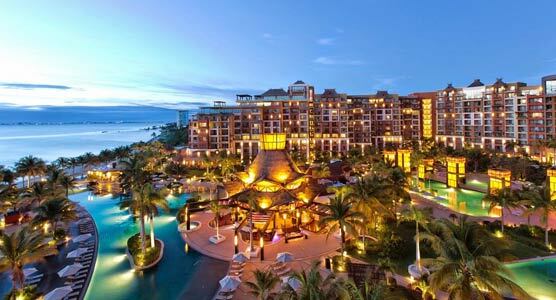 If you want city meets the sand, spend the day at Playa Forum. You may not be able to give your love an island, but you can easily visit one! The top most romantic island spots around Cancún would be a trip out to Isla Mujeres or Isla Contoy. Isla Mujeres has a small central area with charming boutiques and restaurants or you can spend your day on the idyllic beaches. For a more secluded day trip, go to the uninhabited Isla Contoy. This island is a nature preserve filled with stunning tropical plants and fascinating bird watching. Lastly, the cornerstone of epic romance is the perfect dinner. With Cancún’s magic being the azure coastlines, dinner on the beach is necessary. Being a vacation around playful moments in a tropical paradise, you also want the restaurant to cater to the laid-back atmosphere while still providing class and a gourmet meal. An option for evening entertainment adds to the moment and a reservation at sunset makes the energy come alive. 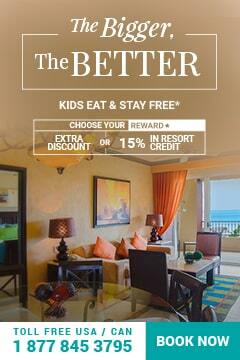 This is where a stay at Villa del Palmar Cancún really shines. For dinner and a show, with a large variety of gourmet international food and sweeping views of the beach, head to Caprichos. There are four fine dining establishments on site, but for that truly special moment, set up a private dinner for two served directly on the beach. This will be the crowning moment of your romantic holiday!